As far as Houses Divided go, my husband and I have always considered ourselves pretty low key. Neither pachyderm-shaped cakes nor champagne-drenched renditions of “Glory, Glory to Ole Auburn” figured into our wedding day. Our Christmas collection bears a respectable 3 to 1 ratio (nativity to national championship ornaments that is). And when we tune into Finebaum, it’s to laugh at the amusingly passionate callers rather than to dial in and trade barbs with them. 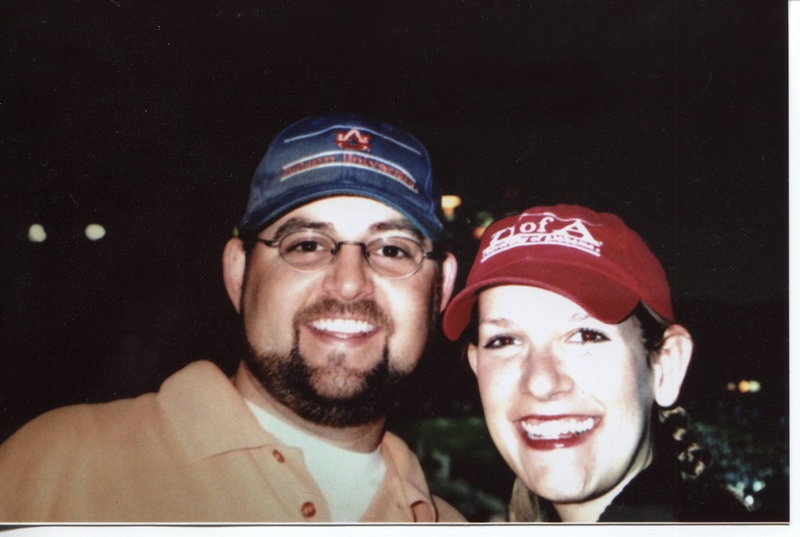 Rett and me at the 2003 Iron Bowl, played (and won by Auburn) at Jordan-Hare Stadium. In the early years of our marriage, still reveling in that naïve newlywed mojo, we would blithely enter into each Iron Bowl with a friendly bet on the outcome of the game. If Alabama won, I’d name our soon-to-be-adopted first pet. If Auburn won, he’d pick the next vacation spot. Yes, we secretly giggled at our friends who wore golf pants peppered with the Auburn logo that they thought were just rockin’, and alternately marveled at how so many diminutive, otherwise well-heeled women didn’t just buckle over from the weight of their ginormous elephant-themed jewelry. Oh, we thought we were so far above The Rivalry. And then we went and had a baby. In the beginning, there was a shared camaraderie – just get the tyke interested in football. And before you could say “national championship,” we’d accomplished our goal. While other babies watched Sesame Street, Ella watched Herbstreit. But then, hardly a week after our mutual utterances of “Oh honey, it doesn’t matter to me which team she cheers for,” that noble civility gave way to an all-out battle of wills to claim the athletic allegiance of our littlest fan. I should have known something was up when he leaned over the night before the Alabama – Virginia Tech game and told me, “You sleep in tomorrow. I’ll take care of the baby.” Um, sold! But when I headed downstairs the next morning, my reverie from a solid night’s sleep was cut short at the sight of our gorgeous daughter, wearing something decidedly ungirly and … was I seeing this right, navy blue and … orange? No matter. Two can play this game. Forget that she’d hardly uttered “Dada.” I knew what I had to do next. And so began our new repertoire of Mommy and Me musical favorites: The Itsy Bitsy Spider, Old MacDonald and Yea, Alabama! (with some misgivings about teaching the word “hell” to a toddler whose most complicated utterance to date is “uh-oh,” I’m saving Rammer Jammer for a less tender age – like three). While we were expanding our vocal horizons, I figured a little reading enrichment couldn’t hurt either. And so, for our beach trip this past summer, I packed only the essentials for my avid little reader: Baby Einstein’s First Words, Goodnight Moon and the Sports Illustrated 2010 College Football Preview (Alabama Crimson Tide, edition, of course). By the time we reached Destin, I was wiping magazine print from her pudgy little hands and collecting the dampened scraps of our defense’s cover shot from the corners of her mouth. When he retaliated by convincing our dogs that Ella’s stuffed “Bear Bryant” teddy bear (from the mother-in-law, natch!) was theirs for the taking, I upped the ante, field-trip style. Just in case this past spring’s A-Day experience wasn’t enough to entice my little peach with all things Crimson, I threw in a rush skit preview for good measure. Now, some might suggest that having a houseful of sweet little sorority gals gushing over my precocious tot equals playing dirty. I don’t know these people. Not that I’ll stop trying to convince her otherwise, but I’m fully prepared for the day when Ella declares herself a Tiger. After all, little girls do aim to please their daddies. But by the time she’s a tween, those national championships will begin to speak for themselves anyway. So I predicted the gender right, but couldn’t have been more wrong on his team allegiance. 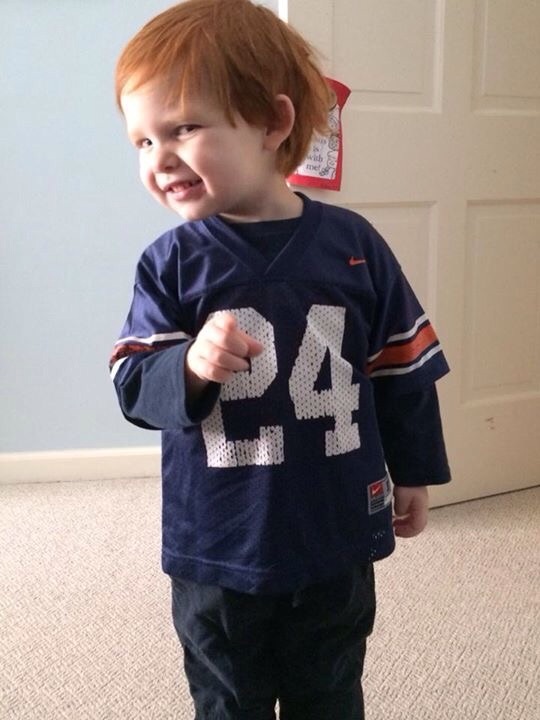 Connor Walden came into this world with Auburn hair, and he’s been a Tiger ever since. Maybe this next one will be a boy. And you know, the name Nicholas Bryant is beginning to grow on me. Originally published in the October 2010 B-Metro (The Littlest Fan).